Over the last few years a major shift in connectivity has been gaining speed; we have moved away from a laptop era and into a fully mobile era, where we connect to our friends, family, and colleagues through multiple devices - growing to 4.3 devices per user by 2020* -- and where business transactions are often made over the cellular network. The resulting influx of devices, users, and applications trying to access the network can result in poor indoor coverage and performance. And with the coming growth in the Internet of Things contributing to 26 billion connected devices in 2020, providing the right coverage to indoor spaces will become a greater challenge. To support these changes in connectivity, Ericsson (NASDAQ: ERIC), long recognized for high-performance, innovative hardware, is pushing performance further by adding capacity and functionality with software-only upgrades. Today, it announces its next major software release, Ericsson Networks Software 16A, which will feature a new suite of LTE software upgrades targeting the indoor space. Among the hundreds of new and enhanced software feature options in Network Software 16A, the new suite features advances in uplink and downlink performance - boosting network uplink speeds by up to 200 percent, downlink speeds by up to 30 percent and adding LTE Unlicensed (LTE-U), the first commercial step in Licensed Assisted Access - as well as features to support greater energy efficiency of small cells. To achieve these gains, Ericsson has been working with leading customers on lab tests and trial activities. Mike Sapien, Principal Analyst Enterprise Services, Ovum, says: "While operators have understood that they need to design mobile networks for increasing amounts of data now, Wi-Fi networks have traditionally been the solution of choice for indoor connectivity for enterprise customers. However, Wi-Fi cannot service the need for reliable and mobile voice services or text messaging, much less handle the business-critical applications that require the app coverage, voice services, and full mobility provided by cellular. Now, as we move toward 5G, both cellular and Wi-Fi will need to work together to offer differentiated and seamless service." Increases in video and media uploads by businesses and consumers via apps like Instagram and Facebook call for better uplink speeds. Ericsson Networks Software 16A includes two uplink enhancements that will enable mobile operators to utilize 64 Quadrature Amplitude Modulation (QAM) on uplink to provide 50-percent better peak speeds of 75 Mbps. In addition, it enables uplink carrier aggregation, which can double uplink data speeds. Combined, these improvements provide peak uplink data rates up to 150 Mbps, which is a 200 percent improvement. Further enhancements focused on the indoor space boost download speeds by 30 percent using 256 QAM encoding. Earlier this year, in a live demonstration with Ericsson, Telstra achieved the world's first download peak rates of 600 Mbps using this new feature. Devices that support these advances become available this year, in line with commercial availability of the Ericsson Networks Software 16A. Networks Software 16A also includes LTE-U, to drive higher performance. LTE-U enables operators to combine the reliability of licensed spectrum with indoor data speed boosts provided by unlicensed spectrum. Arun Bansal, Senior Vice President and Head of Business Unit Radio, Ericsson, says: "To keep pace with mobile broadband demand from both consumers and industry, operators need solutions that deliver both high performance and efficiency. Ericsson's indoor software innovations deliver both. And, these new features combined with Ericsson's end-to-end solutions, flexible go-to-market and business models and proactive relationships with key device ecosystem partners, ensure that our leading operators not only keep pace, but set the pace." Ericsson Networks Software 16A builds on energy-efficiency capabilities in previous releases and now includes Cell Sleep mode. This feature enables individual carriers to automatically switch off during periods of low traffic demand, ensuring greater energy efficiency of small cells. Indoor is the new hub of mobile activity and operators will need strategic models and services to cover this huge footprint. To complement operator efforts, Ericsson is expanding its use of channel partners, such as Anixter and working with leading real estate developers and property managers, including Skanska, helping to create new business opportunities. Through Ericsson's flexible service and business models, mobile operators can choose their level of involvement. For operators who wish to deploy and manage indoor networks themselves, Ericsson offers easy-to-deploy hardware and installation tools. Ericsson Global Services offers a comprehensive range of small cell services, from strategic network analysis through design, integration, optimization and monitoring, right up to a fully managed Small Cells as a Service (SCaaS) offering. With SCaaS, complete ownership of the hardware and deployment is handled through Ericsson Global Services, allowing for a simple and easy go-to-market model for indoor opportunities. Ericsson also offers enterprise solutions for operators to bring to their customers, ranging from Mobile Unified Communications and Video Communications to Managed Enterprise Cloud. Ericsson and key device ecosystem partners, including NETGEAR®, will showcase indoor solutions enabled by the new Networks Software 16A at booth #4322 at CTIA Super Mobility 2015 in Las Vegas on September 9-11. Demonstrations will include LTE-U Fair Sharing of licensed and unlicensed spectrum for LTE support and LTE 3 Carrier Aggregation with 256 QAM for speeds up to 600 Mbps. 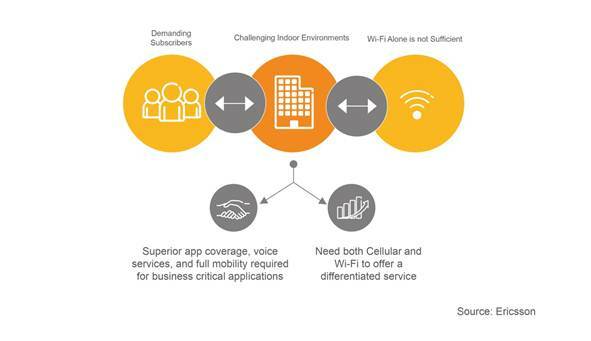 Cellular coverage is needed indoors to deliver a seamless experience and connection when subscribers are on the go - either from one floor to the next or from inside to outside.